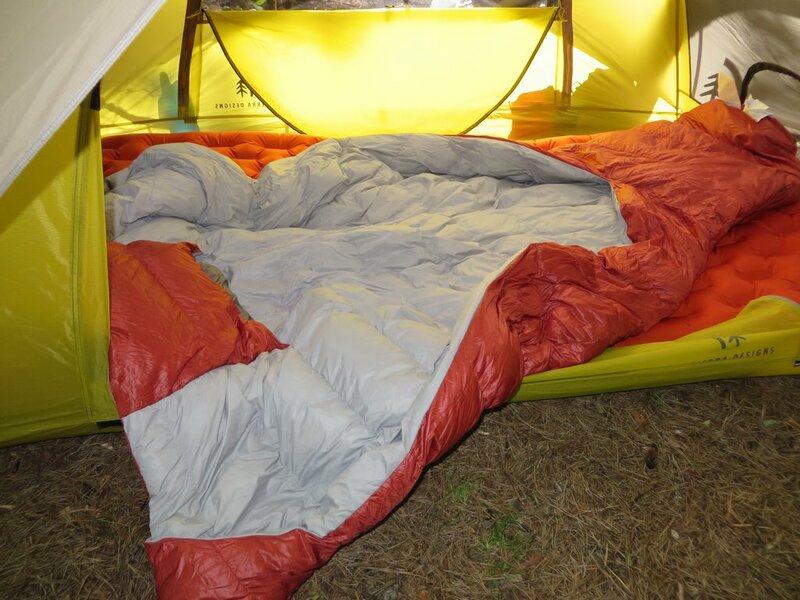 The Sierra Designs Backcountry quilt is designed to add a little bit of extra comfort to the new trend of minimalist quilts that are gaining popularity on the market. Backpacking Quilts are basically quilted blankets, with a foot box sewn into them. Typically, you will only have a small blanket to cover up with, no zippers, and no hood. This is all for the sake of weight savings, pack size, and simplicity. 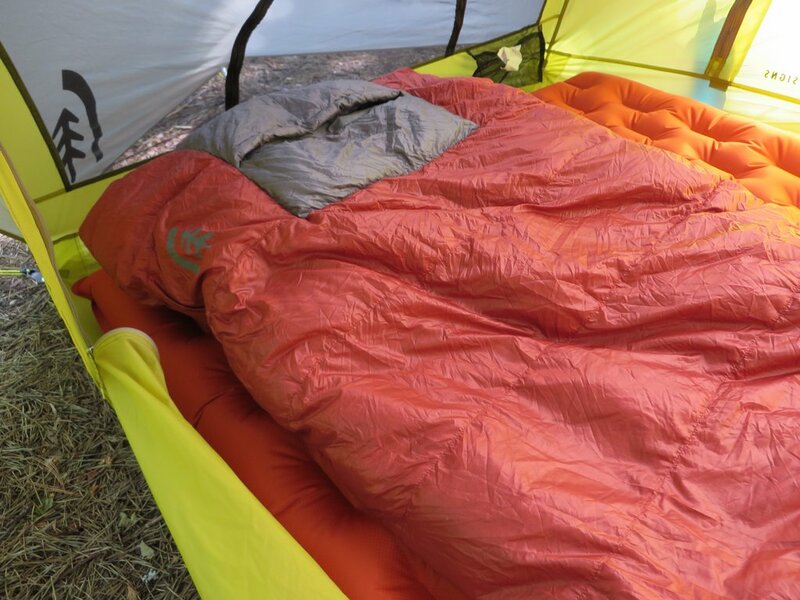 The SD quilt adds an area that you can tuck your head and arms into for those chillier than expected nights, plus it’s wider and provides a larger foot box than most minimalist quilts. It has 11 ounces of 800 fill DriDown to keep you warm and dry. The entire quilt only weighs 1 lb, 8 oz. It is rated at 38 degrees, and fits a sleeper up to 6 feet 4 inches. The quilt weighs very little, barely making the scale flutter at 1 lbs 8 oz. It’s insanely comfortably, and has a great “at home in bed feel”that’s hard to mimic. The materials are soft and silky to the touch, with plenty of loft. While sleeping, I actually forgot that I was covered up, a true sign of comfort. There are no zippers or cinches, so getting in and out is simply a matter of turning over the blanket. It feels effortless, natural, and completely nonrestrictive. Having the small head box (hood?) allows you to tuck your head inside, and there is a small vent for your face for breathing. When the temperatures begin to fall, this is a great way to add a bit of extra warmth, allowing it to act like a mummy bag. There are small pocket like compartments on each side that allow you to slip your arms into them. This is a great addition for those side and stomach sleepers. This lets you to wrap the quilt around you, instead of leaving your arms exposed to the air when sleeping on your tummy. The larger than average foot box gives you extra room to move around when tossing and turning, while still keeping your feet warm and cozy. Furthermore, the entire quilt is slightly over sized, which gives you more space to move about while staying completely covered. You really get the sensation that someone put a lot of thought into designing the quilt to suit the needs of the sleeper, and it pays off. I couldn’t find anything I didn’t like about this quilt, but a couple things worth of mentioning if you’re considering ditching your traditional sleeping bag : Obviously, there is no insulation under you from the quilt itself, so if you’re a cool sleeper you will want to pair this with an insulated sleeping pad. It’s only a 2 season sleeping garment, so you’ll only be able to use it on those warm weather treks. This is my new go to warm weather sleeping apparatus. The simplicity, yet functionality of the quilt is refreshing. Having no zippers or cinches simplifies sleeping back to what it should be, climb in and go to sleep. This lack of restriction completely eliminates any feeling of being trapped inside a sack. The quilt is comfortable, roomy, and warm to it’s rating, yet always regulating my body temperature as to not overheat. Any way that you sleep, the quilt will keep you covered and comfortable. The head pocket and arm sleeves feel like gifts, especially if you like to sleep on your side or stomach, where your arms would normally be outside of the sleeping bag. I can’t say enough positive things about this simple but considerate design. If you want to cut weight, but not suffer for it, this is the way to go. Pillow Fight! The Best Backpacking Pillow? I try to not directly compare products in my reviews, so I’m really happy you asked this question, as it’s a good one. I’ve noticed that you hike at fairly high elevations often, and for this I would certainly recommend the womens backcountry bed, 3 season. It’s rated at 25 degrees, verses the quilt at 38 F. Either the 600 or 800 fill would be fine, but the woman’s model is actually warmer. I say this, as anything above 10,000 feet is rarely ever going to be higher than 40 degrees at night. You would get much more use out of the bed than the quilt. I say this assuming you don’t have a nice cool weather bag that you’re happy with already for those chilly nights. If you’re just wanting to cut weight on some warm weather trips, or you only backpack in warm weather, the quilt is certainly my favorite “sleeping bag” at the moment, and is a fine investment if it’s simply supplementing your collection. 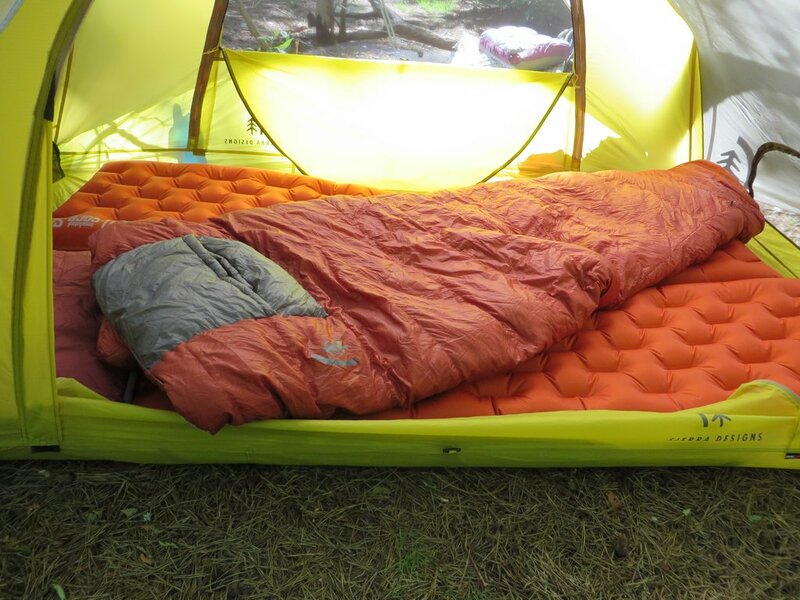 You will simply get much more use out of the Backcountry bed. Both are phenomenal choices. That’s a bit long winded, but I hope it helps. If I can help further just let me know. I’m happy to help. Thank you! We have some old school Sierra’s that will work until we can save up for the beds. I have seriously been eyeing the bed since you posted your review as I hate sleeping bags in general and just love the idea behind this bed. After I read your post it popped up in Backpackers best of magazine. Sierra is really doing some great things! Thank you so much for your input!!! I’m glad I could help. If you have any other questions, just let me know. It’s a great bag, you won’t regret it one bit. Especially if you’re a gear junkie like myself. I did some measuring, and I got approximately 81″ long, laying loosely on the ground, and around 35″ wide. I measured width as having fabric laying over the shoulders and completely covering the body, as you can get different widths depending on how you lay it out. I hope this helps. I plan to start weighing items soon, to see if the factory specs match up. Thanks for that. If you get a chance, however, I would love to know the upper maximum width of the quilt while laying flat. Anything under about 55″ is too narrow for me. Thanks again – BTW, just picked up a Flashlight 2 UL for my son and I. So fat I have just set it up but am very impressed with the room and features. At the widest part of the quilt, I’m getting 45″, which is pretty solid for a quilt. I’m not aware of a quilt that measures 55″ across at the shoulders, but I’ll keep an eye out for you. Good luck with the Flashlight 2! I’m hoping to test that one at some point myself.